There are tons of English words used in French. To the French, knowing English is a way to stay trendy and cool. This is 10 times the case in Paris. English is found in popular culture (movies, TV series, and music) and used in business. Also, with all the new technology and software coming from Anglophone countries, the French language uses more and more English words and Trademarks. Borrowed words are known as loanwords or in our particular case, Anglicisms. However the English words on this list may be repurposed to different contexts OR pronounced with a heavy French accent, à la française! 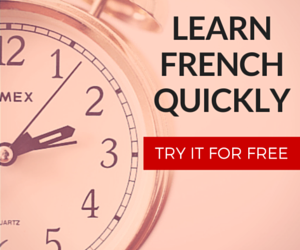 So what are some common English loan words that French speakers use? Here at FrenchCrazy I created a huge list. 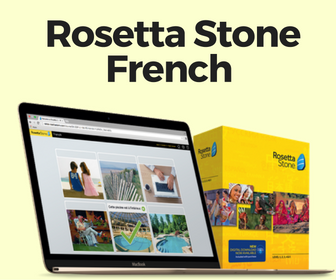 I know I’ll disappoint some Canadians, but this list focuses on the French spoken in France. There are many speculative etymologies for where the word “okay” originated from, but most agree that the United States created and popularized the word. Okay’s meaning is universal. The French could use the words D’accord or D’acc to signify agreement, but oftentimes prefer “OK”. “Happy Hour” (pronounced: ah-pee-owar) can be seen plastered on signs across France. Happy Hour is a magical time of day where drinks are discounted in an effort to drive business. A lot of bars in French cities participate in it. In France you can faire un brainstorming to come up with more creative ideas. This word is 100% an Anglicism. This Anglicism is omnipresent in France. Despite it being pronounced like ouiquènde we spell it as week-end (the correct spelling is with a hyphen). The word stop has origins stemming from Old English and proto-germanic languages. 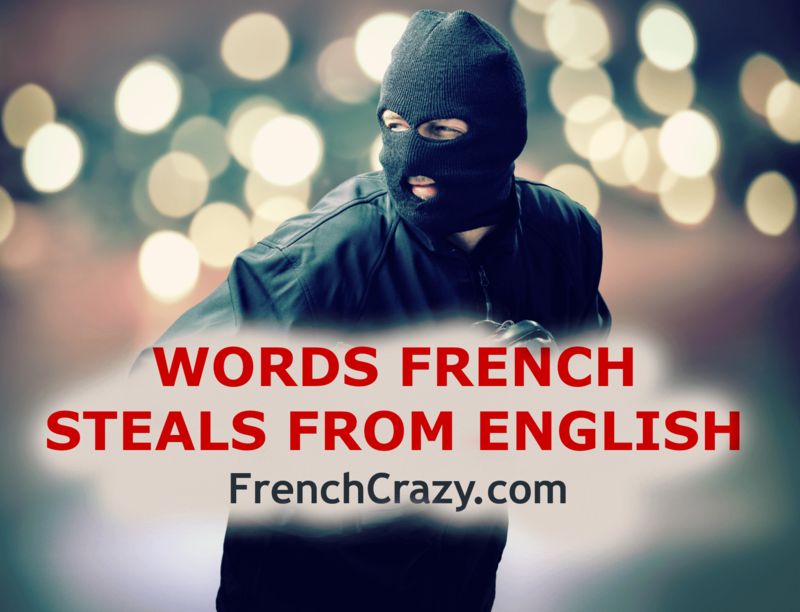 Nonetheless, the French language borrowed the interjection and verb from English. Stop is oftentimes associated with stop signs because that’s what’s written on them. Likewise people may yell “Stop!” to get you to halt although the French do have their own verb, arrêter. French uses the word “football”, oftentimes shortened to le foot. This word originated from England. The word Rugby came from Rugby, England. Finally, basketball comes from American English; it’s a sport created by a Canadian living in Massachusetts who later became an American citizen (go figure). The word brunch is an Anglicism with the practice made popular in the United States. A brunch is a large breakfast enjoyed around the hours of 10AM and 3PM. Some French people have adopted the custom as well as the word. Interestingly the origins of brunch has me stumped. Some sources say the idea came from a British writer in 1895, while other sources say it first came from New Orleans, USA. Un smoking has nothing to do with cigarettes. This loanword is an alternative used to describe fancy suits. Un slip (pronounced: sleep) is men’s underwear. Un sweat (pronounced: sweet) is the shorthand term for a sweatshirt. This word has the same meaning as in English, but is generally used to talk about employment that’s temporary and unimportant. The French word emploi is a bit more standard and formal. Un parking is a noun in French to talk about parking lots. The verb to park, however, is denoted by se garer or stationner. These words are self-explanatory. They come from popular culture references and music. Voyou could replace “thug” and the abbreviations of MDR or PTDR are substitutes for “lol”. An interview describes when journalists ask questions to persons of interest. The word entretien is used for job employment. This word follows the same sense in French as in English. When you need to regroup and plan for an event or situation, you can have a briefing. Following an event you debrief. ASAP (as soon as possible) can be used in writing to represent dès que possible or DQP. Footing and jogging are two ways to describe jogging in French. This French word shares the same meaning as in English. If you want to re-watch a TV show that you recorded then we use the words en replay. Streaming is when you watch a film or TV show for free on the internet. En live is a way French reporters or TV shows say they are en direct, or recording at the present moment. 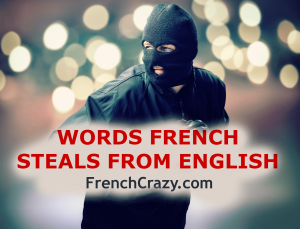 When a kid is abducted in France, we usually borrow the English word kidnap and Frenchicize it. The French word enlever could also work. While organizations like the OQFL have found alternatives to these English loanwords, let’s be honest – few people follow their suggestions. A bug is a glitch in a system or a computer program. French borrowed these words from English despite there now being a few alternatives which nobody uses. Hi, hello, what’s up, see you (CU / CYA), bye, goodbye, and bye bye all could be used and understood when speaking in French. The best way to open or close a conversation, however, would be in French. I can’t think of many Americans in the States who would greet one another with a hearty “bonjour”. This is an elegant way to tell others what the acceptable dress wear is for the event. I’ve seen this word in brochures as well as posters and signage. Foods which originated from English countries are borrowed in French. Trademarks and large corporations retain their names within the French language. All French people taught to English during their educational career, so I’d venture that the average French person has more exposure English than their American counterparts do with French. We call sneakers “des baskets” (baskette), a commercial failure “un flop” (floppe), an information we didn’t ask for “un spoiler” (spaullieur), some information shared by a client “un brief” (briffe), a knuckle bump “un check” (tchèkke) and a bad president “un Trump” (treumpe). C’est ça la mondialisation! Now I will eat “un cheese burger” (sheeze beurgeure) with french fries (des frites). What about ‘challenge’? I heard an interview where the guy said ‘challenge’ but with the English pronunciation. Why do that if the word also exists in French? “Le Best of” and “Le Making of” are sometimes used in titles of Web pages and YouTube videos, sometimes hyphenated (le best-of) and sometimes without “le”, eg. “Le best of les Simpsons” or “Le Marché Noël: making-of” (I made up both of these titles). A faux English term I’ve encountered is “relooking”, which is French word for makeover but if you think about it “relooking” is actually a more sensical word. One French term that doesn’t directly translate into English that I wish we would adopt is “internaute” for people accessing the Internet through a Web browser. In English, we just say “users”, “visitors” (people that visit a site), “web browsers”, or “web surfers”. I like how French has one term that is applied across a range of usages. Amazon France greets visitors to its website with a message beginning “Cher Amazonaute”. When looking for a definition of internaute just to verify my understanding before posting this comment, I saw the term “mobinaute” for people using the Internet on mobile phones. I’ve never seen that word before, so it may not be common, unlike “internaute” which is ubiquitous. Internaute is also not just slang or a youthful term. I have seen it used by a couple seniors in profiles/prose on a French genealogy website, referring to people who have contacted them with information or questions. Interesting. Some things to keep in mind when it comes to the French using English words. The French only keep some English words when they can say them in a French manner. So, for example, if you say “warning” as you would at home, they would not understand it. That way they are not adopting these English words, but rather turning them to French. In the way “rupee”, “masala” became English. Counting “proper names”, Starbucks, McDo… is a far cry. New York is said with the same sound in many words but it is not counted as a word adopted. Or, my name stay the same either in French or in English. So pay attention where to count. It’s an Interesting subjet that you are pointing out,because only yesterday I was looking on French television a documantary concerning the “Norman Invasion of England by the Normands ( +the french and the Bretons ) who were part of the Invasion ,and how after the English language took so many French words wich still exsist today !.But I beleive as our countries are “So CLOSE”We too in France all along the centuries have incorporated so many Anglo-Saxon words in Common French Today! And if you take the main four latin countries in Europe ( France-Italy-Spain-Portugal),France is the “LEAST” really latin speaking country of all theese four just named ! !You have to bear in mind that who founded France it was King CLOVIS at the head of the FRANKS,wich were a <germanic <tribe who came from the other side of the RHINE ! !+ all the french words wich end with a X,,ONLY FRANCE HAS THIS ?!? !Like myself ,I live in the VOSGES in eastern France ( the name come's from " VOGESEN" ,german word +we have 3 départements who still speak german tody and are reconized as " BILINGUAL" french and german ! ( moselle-bas rhin-haut rhin ( or ALSACE),so I thick that ther will be an evolution concerning languages in Europe! Is “picnic” one of them? I have head ‘ smoothies ‘ used in French, referring to fruit smoothies but pronounced ‘ smooties ‘ as they have trouble with the ‘th’. A good few years ago, I heard le warning used, to refer to the warning hazard lights on a car! I suspect there are many computer terms which have been borrowed. Maybe add “chewing-gum” to the list it’s the same in both .